​Sydney, 24 July 2013 – There has been a step change in the volume of cross border investment in the Australian commercial property sector. Global investors are viewing Australia as attractive relative to the pricing and risk-return profile of other markets, according to the global head of research for CBRE, Nick Axford. 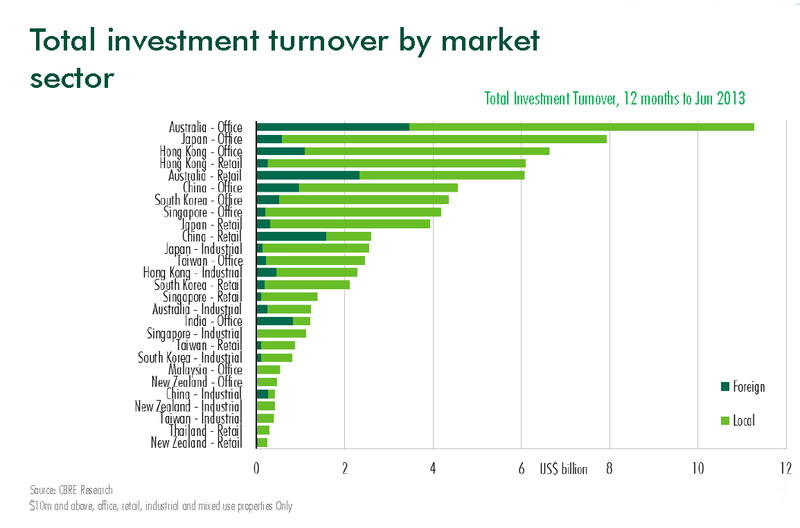 Speaking today at CBRE’s annual Market Outlook breakfast in Sydney, Dr Axford said office property in Australia had attracted the most cross border investment in Asia Pacific in the 2012/2013 financial year, with Australian retail property ranking 2nd in relation to cross border investment in the region. 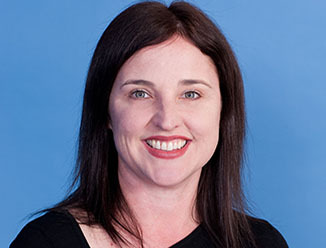 “We’ve been saying for a while that the Australian market looks attractive and good value,” Dr Axford said. Taking a broader view of global economic conditions, Dr Axford said investors remained nervous about the impact of potential changes to monetary policy, particularly in the US. “As a result, prime property continues to look attractive to investors, and whilst yields are low the spread between property and bond yields remains quite high, which should offer some protection from any future rise in the risk free rate,” Dr Axford said. Dr Axford also urged investors to remain flexible and not build set timeframes into their future sales and refinancing strategies given the expectation of ongoing volatility in the global economy. At a local level, CBRE’s Head of Research for Australia, Stephen McNabb said the market had been through three key phases over the past decade, the first phase being one of “unsustainable expectations” and the second being a “rebalancing phase” between 2007 and 2012. He characterised the third and current phase as being one of balance, with an improvement in the debt and equity markets and a stabilisation in yields across the office, retail and industrial sectors. Mr McNabb said an ongoing issue was the weakness in the occupier markets, which would continue to be hampered by softening GDP growth in 2013/14, which was expected to slip below 2%. “The expectation is for below trend growth for the next two years before we move back to trend in around 2016,” Mr McNabb said. However, Mr McNabb said the outlook was for a modest recovery in office demand from next year and while CBD office vacancy rates would increase they would remain below the long term range of movements with the exception of Brisbane. Net effective rents were also expected to stabilise next year. On the industrial front, Mr McNabb said rents were stronger than the long term average but some slowing was occurring. 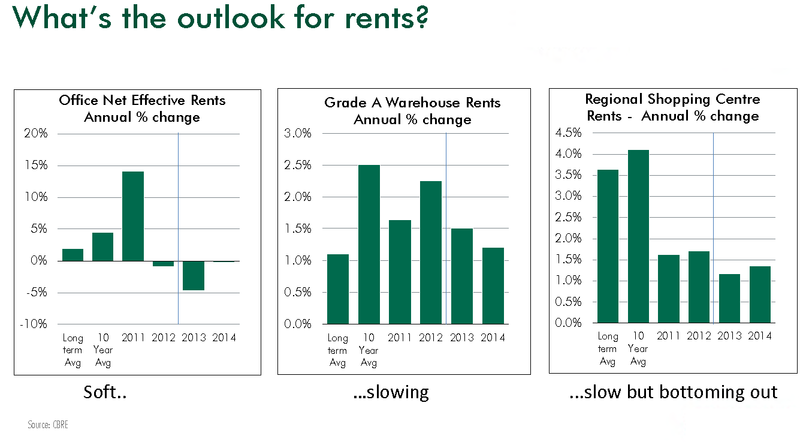 Retail rents were meanwhile expected to bottom out this year before improving marginally in 2014. Turning to the outlook for yields, Mr McNabb said prime assets were clearly outperforming. “Caution and leasing risk is holding back the secondary market however however there is potential for a broader improvement and for yields to move lower post 2015 if growth expectations and confidence is restored. Mr Cullen said there were a number of key themes in relation to buyer demand in the current market. He also highlighted that buyers were being led by assets rather than markets. “We have witnessed major sales in each of the key markets – 480 Queen Street, Brisbane; 567 Collins Street, Melbourne; Raine Square and Kings Square in Perth and 200 George Street in Sydney,” Mr Cullen said. Mr Patterson highlighted that business expansion had been limited across all market sectors nationally over the past 12 months. Mr Patterson said enquiries were coming to market much earlier across all size ranges. However, the most active end of the market was for fitted out tenancies between 100 and 1,000sqm with a price point of between $750/sqm and $850/sqm gross. Mr Patterson said that with 200 whole floor options in the Sydney CBD, many landlords were also subdividing floors and providing fitted out options to generate activity. Mr Proudlove said that in the current environment, it was a case of going back to the basics and managing tenants. It was critical to have strong covenants in place, to focus on active cash flow management and to have a clear business strategy, avoiding poor leasing deals just to maintain short term cash flow. When asked about whether there had been a recalibration of return expectations in the sector, Mr Proudlove said there was no generic answer to the question of recalibration, albeit for prime quality assets, owners were looking at lower total return expectations, given the current low economic and retail sales growth environment. Mr Proudlove also said, that for individual centres that dominated their trade areas, these would continue to out-perform the market. Cap rates were also are firming, particularly for the better quality stock on offer, with investment demand over-riding some short/medium term performance concerns. Mr Charles said the major retailers were spurring considerable leasing activity in the industrial sector, primarily involving build to suit facilities. Examples included Bunnings committing to 43,000sqm of space at Eastern Creek, Sydney; K-Mart reconfiguring it national distribution network over the past two years including a 50,000sqm facility at Lyton near the Port of Brisbane and 50,000sqm at Eastern Creek in NSW. On the investment front, Mr Charles said a shift in the industrial investment market has been highlighted by the interest in the recent Sydney offering of 4 Inglis Road, Ingleburn. The 45,000sqm facility had two tenants in place, however the leases expired in 14 months times.